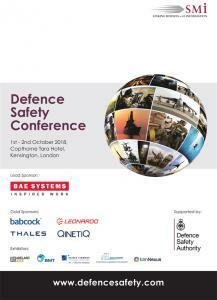 LONDON, LONDON, UNITED KINGDOM, July 2, 2018 /EINPresswire.com/ -- BAE Systems have confirmed their participation as the Lead Sponsor of the Defence Safety Conference (http://www.defencesafety.com/einpr ), taking place in London on the 1st and 2nd October 2018. BAE Systems is a global defence, aerospace and security company. It’s wide-ranging products and services cover air, land and naval forces, as well as advanced electronics, security, information technology, and support services. They will be presenting, exhibiting and hosting the VIP Military Dinner at the conference. There is now limited industry speaking slots and exhibition space available. The Defence Safety Conference is the first of its kind, exclusively dedicated to safety across the defence domain and will cover the broad spectrum of safety across military aviation, land and maritime. This exclusive conference offers organisations the opportunity to show their commitment to safety and to join over 250 other senior leaders from across the armed forces and industry to collaboratively raise the importance of safety on the defence agenda. Registration for the event is free for active military and government personnel, however pre-registration is required on the event website, which is subject to final approval by SMi Group. There are now limited opportunities available for commercial organisations that wish to attend or exhibit at the conference, contact SMi Group for stand prices and availability.